The holidays are over, the eggnog has long disappeared, and the New Year is upon us with its high standards for achievement. Many people break their resolutions within days but there’s still time for you to make a resolution that will last. If you want to commit to a better you without all the hassle of counting calories, a professional tech certificate from Camp Tech might be the perfect solution. At Camp Tech, you can easily develop skills you’ve always wanted to learn like building a website, learning SEO (search engine optimization), and tracking your site’s performance with Google Analytics. When you complete a Camp Tech workshop, or register for a Camp Tech Certificate, you not only obtain new skills to stand out from the crowd, you also receive digital bragging rights for your resume or LinkedIn profile. Choose one of the three certificates on offer at Camp Tech Vancouver: Web Builder, Desktop Publishing, or Small Business Essentials. 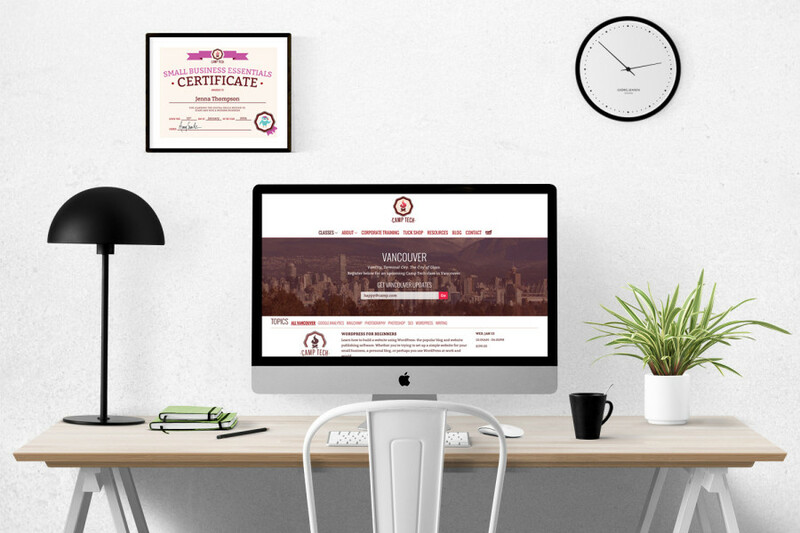 The Web Builder Certificate is ideal for anyone interested in building a website: for themselves, their organization, or even their clients. Choose the WordPress or HTML and CSS for Beginners workshop to build your website. Add great content in Writing Killer Web Content and then learn to track your website’s performance in Intro to Google Analytics. Always wanted to design your own professional print and digital documents, edit your photos, or create your own business cards? The classes in the Desktop Publishing Certificate will teach you how to do all that and more. After completing the Adobe Photoshop, InDesign, and Illustrator for Beginners workshops, you’ll unlock this Certificate and take your company’s marketing materials to the next level. Small business owners regularly have to do everything for themselves, including digital marketing. This Certificate gives you everything the title suggests: the essential digital skills you need to market a business. Learn SEO (search engine optimization), Google Analytics, Email Marketing with MailChimp, and WordPress for Beginners to successfully manage and market your website. Camp Tech creates a fun learning environment that focuses on practical skills you can apply right away. Since the workshops are short (only three or six hours long) and offered during the day, evenings, and weekends, their classes fit into even the busiest of schedules. Not even your personal trainer can say that. What are you resolving to do this year? What new skills will you learn to improve your resume? How can you build your business faster and more efficiently? Invest in yourself now, for the future, and make 2016 count. Choose to develop new skills and apply them to your business, find a better job, or simply level up your personal toolkit. Check out camptech.ca/vancouver for more details on certificates and regularly scheduled workshops in Vancouver.